Although Oakley is now a fan of tomato sauce, her pasta sauce of choice remains pesto. Good thing, given that we have 8 basil plants in 4 different varieties flourishing in our garden. 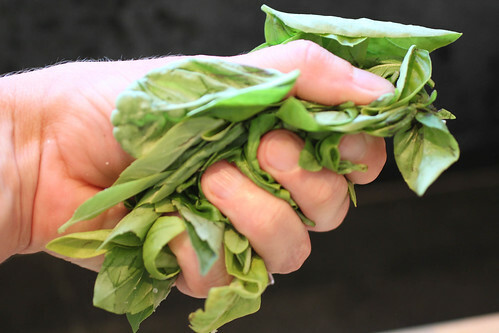 Before we left for our summer trip, we harvested over 4 pounds of basil (and this was just the leaves after stemming! Just think what this would cost at the grocery store!). 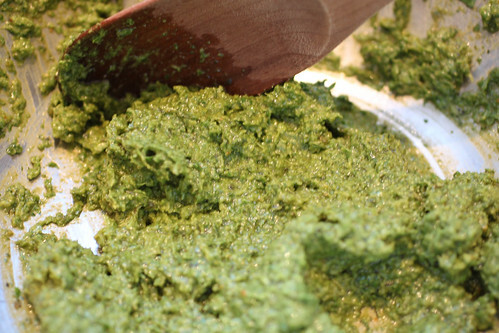 Several batches of pesto are now in our freezer waiting to bring a burst of summer freshness to winter meals of pasta, tomato soup, or pizza. 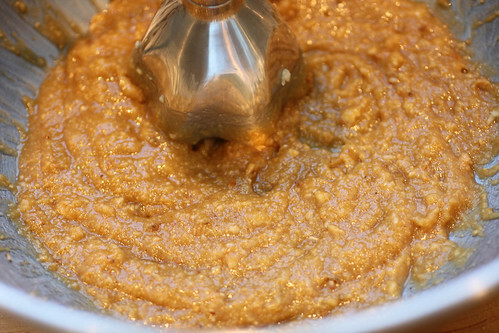 The name for this versatile sauce comes from pestle, as in the mortar and pestle traditionally used to pound it. Not interested in having a 15 minute arm workout just for dinner? 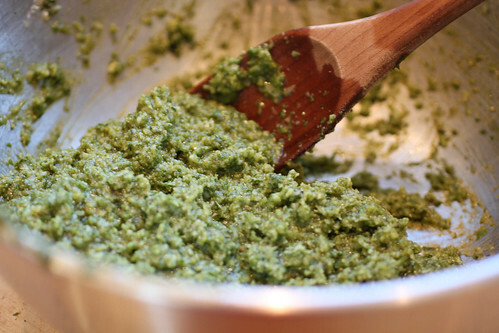 Well then, feel free to cheat and use a hand blender as your modern-day pestle to make this classic pesto. Or is it now blendo? 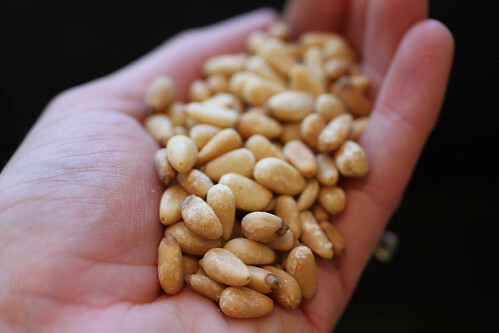 Using a hand blender (or blender, food processor, or, to really be correct and get a gold star, a mortar and pestle), grind the garlic, pine nuts, and an ample pinch of salt with a splash or two of olive oil. 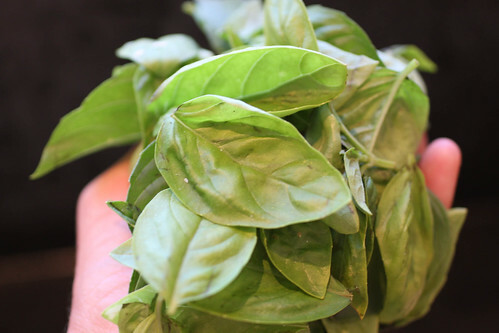 Add basil and parsley a handful at a time and blend until you reach a creamy consistency. Fold in the cheeses with a wooden spoon. 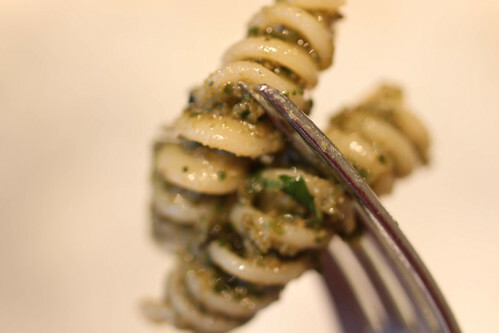 Slowly add olive oil, mixing until the pesto is smooth and creamy. (I leave it quite thick if using as a pasta sauce and thin it out with more olive oil if using as a garnish, say drizzled over some heirloom tomatoes.) Taste and adjust salt. Meanwhile, cook pasta and vegetables in heavily salted boiling water until the pasta is al dente (which for me, is usually about 3 minutes less than the suggested cooking time on the box). Drain, being sure to set your colander over a bowl to reserve the cooking water. 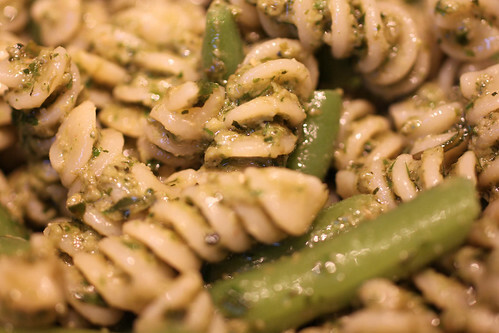 Return the pasta and vegetables to the pot, which is now off the heat, and mix in the pesto. Thin with cooking water if needed. 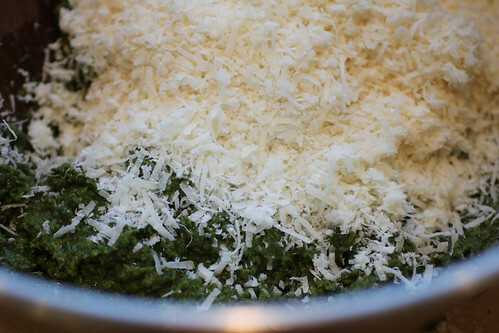 Top with freshly grated Parmesan. 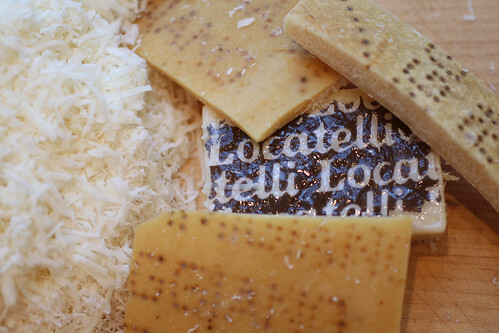 To freeze: Prepare as above, but stop before adding the cheeses. Place in an air-tight container, cover with thin layer of olive oil, and freeze. When ready to use, defrost and mix in the cheeses. Drizzle in olive oil as needed. 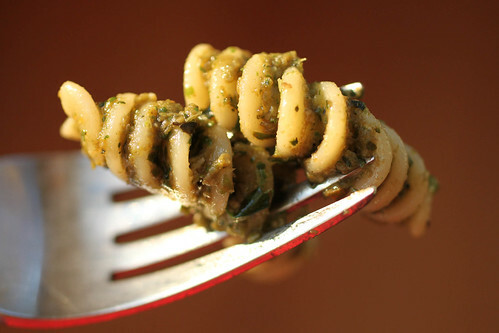 One Response to "Classic Pesto"